A tale of two STS-128 patches: the crew patch (left) and COLBERT emblem (right). Two embroidered patches designed for space shuttleDiscovery's mission to the International Space Station beginning this week havegone from being simple souvenirs sold at NASA-themed gift shops to rarecollector items selling for as much as 35 times their retail price. One of the patches, the STS-128 crew's official mission insignia, became morecollectible after it was discovered that its depiction of the stationwas missing a module: the European Space Agency's (ESA) "Columbus"lab, which was particularly notable given the inclusion of a European astronauton-board Discovery. 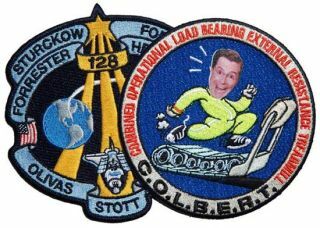 The other patch features the face of comedian Stephen Colbert, whose name waslent to the astronauts' treadmill launching with STS-128. Now sold out afterits production run wascut short due to licensing issues, second-hand sales and auctions arecommanding astronomical results. Both patches have examples packed onboard Discovery for the 13-day mission,which is scheduled to liftoff from Kennedy Space Center at 1:36 a.m. EDT onTuesday. STS-128 mission specialist Pat Forrester is no stranger todesigning space patches. In addition to being the artist behind the STS-128patch, he also created the patches for his two prior space missions (flights heshared with STS-128 commander Rick "CJ" Sturckow and in the case ofSTS-117 in 2007, fellow STS-128 mission specialist Danny Olivas). The difficulty Forrester says, is finding new ideas while still representingthe mission they are flying. "It becomes a challenge on the 128th shuttle flight," he told collectSPACE.com,"as you look around the halls and see some of the other patches, lookingfor something a little bit different." For STS-128, Forrester chose an oval-shape wrapped in ribbons that depictedDiscovery carrying the "Leonardo" Multi-Purpose Logistic Module(MPLM), a cargo carrier for delivering supplies and new science platforms fromthe Earth to the space station. Bathed in blue and yellow, the emblem seemed toalso mimic the colors of the Swedish flag, perhaps in tribute to Swedishspacewalker Christer Fuglesang. "It wasn't until later on that we kind of looked at it and said 'wow thereare a lot of similarities' with these colors," recalled Forrester. "Iwas just looking for more blues, a lot of the [past] patches weren'tblue." Similarly, it wasn't Forrester's original intention to depict a specific spacestation configuration when he sketched the concept for the patch. "When I sketch an ISS, it looks a little bit like what you do with acrayon; it wasn't in any way supposed to show any detail. It was basically justsome solar arrays and a mass in the middle of gray," he said. It fell to one of NASA's graphic artists to adapt Forrester's sketch to digitalart and in doing so said the astronaut, a station design was selected from artalready created. The crew saw it and approved the use "but never gave itany detailed [look] because it was not supposed to represent the exact spacestation." Production of the patches began before someone did take adetailed look and noticed something was missing: the European laboratory Columbus. "ESA was quick to pick up on the fact that the Columbus module was notthere," explained Forrester. The art was promptly revised to include the module but it was too late for thepatches: samples that the crew wore during training and those shipped tosouvenir shops were a module shy from a correct ISS. Traditionally, NASA would order new patches to be made upon discovering theerror, but it was one of Forrester's previous patches that drove the delay. "By the time we launched, we were on our fourth mission patch for STS-117 because the nameschanged -- we went through a few crew [changes]," Forrester described. "I think the [Astronaut] Office realized that we can't keep printing athousand patches and then change them three times during the training flow. So theoffice no longer orders patches until we are getting ready to fly." The astronauts received the Columbus-amended patches about two weeks ago. "I believe that all the patches we will be wearing will have [Columbus]," Forrester said. The company that produces the patches for the crew, AB Emblem, also beganshipping revised patches -- which retail for $5 -- to souvenir shops though supplies of the older, nowincorrect design were found in shops at the Kennedy Space Center beforeDiscovery's launch. As with past mistake patches, these Columbus-less badgeswill grow in desire as collectibles. A good example of a discontinued patch becoming a hot collector's item can befound in the other patch that was issued to commemorate the STS-128 mission. Among the ISS equipment Discovery is delivering is theCombined Operational Load Bearing External Resistance Treadmill, or COLBERT.The astronaut exercise device was named after the comedian host of ComedyCentral's parody news show "The Colbert Report," Stephen Colbertafter his name won a NASA poll to title the station's next module. As first reported by collectSPACE.comearlier this month, a patch featuring Colbert's likeness was abruptly pulledoff the market due to a misunderstanding of how the insignia was to be used. Whilea decal of the design will adorn the treadmill in space and at least four ofthe patches are on Discovery for the STS-128 mission, Comedy Central did notintend for the emblem to be sold. A few weeks after stores' existing supplies of the patch sold out, the once $5souvenir started selling on eBay for as much as $180. As of the date of thisarticle, of the few patches to be offered at auction, two had topped $100 inbids, with another was being sold for a "Buy It Now" price of $175.